(VEN) - May 9, 2015, “#WeSpeakCode 2015” event, the highlight of a series of Microsoft activities in order to train the programming language, was held by Microsoft and Nguyen Sieu Secondary School in Vietnam with the participation of about 700 teachers and students from Vietnam secondary schools. This #WeSpeakCode 2015 event was organized to support pupils, students learn about computer science, as well as support free Coding lessons for students of all ages. Through this campaign, Microsoft expects to bring ‘Code’ to become the common and unity language across the region. And programming language will be the tool for young people to express passion and creativity with computer science. "Programming mindset will foster opportunities to promote skills of problem solving, training creative qualities and handling problems in a logical approach. So each persons will better grasp the key to open the doors of success, as well as bring more development opportunities for everyone, increasing the advantage to participate in the labor market, helping reduce burden of unemployment among young people today, especially in Vietnam", Vu Minh Tri, General Director of Microsoft Vietnam speech at the event. With very positive goals, aligns with new social trends, #WeSpeakCode program quickly receives the supports from tens of millions of pupils and students in 180 countries worldwide. In Asia Pacific, when ‘Hour of Code’ events was launched, there were 35,000 students and pupils joining and they created a lot of impression applications products. In Vietnam, through the actual events, online courses and materials online as well as programming contests, #WeSpeakCode project up to now has been helping more than 12,000 young people, whom can understand programming language; in particular, if they are familiar with the programming, these members have the opportunity to develop their coding skills deeply with Microsoft platform. “In order to support Educators and students to deploy this positive trends, Microsoft has been keeping #WeSpeakCode initiative. Despite of the fact that students’ knowledge, just joining or indepth Coding skills, Microsoft will connects and inspires students via Microsoft tools, resources as well as supports the essential experiences in order to help students to migrate the ideas into the real applications. 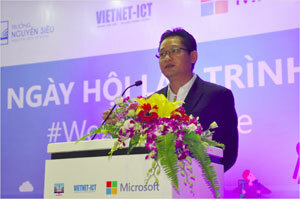 Microsoft believe #WeSpeakCode Vietnam can bring a lot of opportunities for Vietnam young people to be more creative, more innovative and unlock their future into positive trend”, said Vu Minh Tri, Microsoft Vietnam General Director. #WeSpeakCode 2015 event also introduced new IT trends, demonstrated Microsoft new solutions, devices, sevices and highlighted the application, which developed by pupils from Nguyen Sieu, Hanoi Experimental High School, Nguyen Dinh Chieu Hai Phong, Duc Tri Ho Chi Minh. All the applications has awarded by #WeSpeakCode Vietnam project. 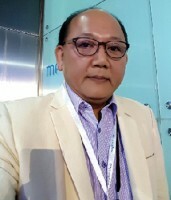 Nguyen Thi Minh Thuy, principal of Nguyen Sieu said: "As a Microsoft Innovative School, Nguyen Sieu School is proud to be a partner of #WeSpeakCode project. And we has been contributing to increase creativity and promote coding activity in Vietnam. Aligns with trend of technology, when the school equipment, appliances and especially the personal devices… are present everywhere, from home to school, at work, programming skills and knowledge will help the youth to optimize the technological advantages of the devices. 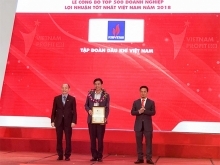 We, representing the teachers and the education sector, are always ready to help students, help you to have a better understanding of computer science, has the core values ​​of knowledge for yourselves and write up a new future for Vietnam". Vietnam set a goal of becoming a strong country in IT with IT workforce is 1 million in 2020 (i). #WeSpeakCode Program represents Microsoft's strong commitment of supporting IT knowledge, experience and cooperation with the Government of Vietnam, especially the Ministry of Education and Training, in the constructing and developing Vietnam IT workforce talent as well as developing policies to promote IT application and create an environment to encourage and promote the creation of the community.